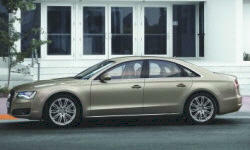 2013 Audi A8 / S8 Pros and Cons: Why (Not) This Car? When Audi came back to life, it was on the basis of the A4 compact sedan. Over the past 15 years Audi has clawed its way upmarket, first growing sales of the A6 midsize sedan, and more recently developing the A8 large luxury sedan into a serious competitor for the Mercedes-Benz S-Class and BMW 7-Series. In recent years, the large Audi has won comparison tests against its arch-rivals more often than not. The car received a new base engine for 2013, with the 333-horsepower supercharged 3.0-liter V6 first seen in the compact S4 taking the place of a 372-horsepower, 4.2-liter V8. Is this a welcome change? More broadly, what about the current A8 has made it the darling of the auto enthusiast magazines and much more popular among buyers of large luxury sedans than earlier generations? The previous review compared the Jaguar XJ to the Audi A8. This time the A8 goes up against the most driver-oriented of the segment's leaders, the BMW 7-Series. A little cold, especially in dark gray, but clean, luxurious, and even sporty. Why the 2013 Audi A8 / S8? A few years ago, soon after the redesigned 2011 Audi A8 and Jaguar XJ reached dealers, I drove both with my father, a potential buyer (he ended up with a Lexus LS). I preferred the Jaguar (recently reviewed here). But my father, to the surprise of both of us, strongly preferred the Audi because its steering when set to the firmest of three levels had more heft to it and felt tighter, especially on-center at highway speeds. To me the Audi's steering did (and does) feel more artificial than the Jaguar's. The BMW 740Li's steering also weights up more than the Jaguar's, and conveys a strong sense of the car's massiveness in the process, but doesn't feel as tight or as direct as the A8's. This more than anything else probably explains the big Audi's comparison test wins. Beyond steering, Audi's "quattro" all-wheel-drive systems have tended to give its cars unperturbable chassis dynamics, and that in the latest A8 follows this tendency, and then some. The BMW even when fitted with all-wheel-drive reacts to throttle inputs in turns somewhat like its rear-wheel-drive counterpart. Give it more gas, and the tail shifts outward, rotating the car. Do the same in the A8, and the car just powers through the curve, its attitude unaffected. The BMW feels more balanced (perhaps because it is) and can be more playful (though you have to really get on it before the car's insulated, massive feel starts to dissipate). But the Audi feels tighter and more precise, and as if it will simply go wherever you point it. As if nothing can stop it. A Sport Plus Package includes an active rear differential that should help induce some rear-wheel-drive feel, as in the BMW. I say "should" because the tested car lacked this $3,500 package. The latest version of Audi's all-wheel-drive system does default to a 40-percent front, 60-percent rear torque distribution, but this at best reduces understeer. It can't fully balance out the nose-heavy car, much less enable some oversteer. This said, earlier A8s had a much stronger tendency to plow in turns. This all assumes that the A8's steering and suspension in dynamic mode. Switch them to normal or even to comfort, and the steering gets lighter and loosens up--a lot--while the suspension gets squirmy. Car magazines haven't been fans of these modes, but they do benefit ride quality (more on this latter). In any mode, the A8 feels BIG, especially in the tested long wheelbase form. I felt more the a little ridiculous when I was the only one in the car. But the BMW feels even more massive. The new (to the A8) boosted six might be down nearly 40 peak horsepower, but it's at least as strong as the displaced V8 at lower rpm (325 lb-ft at 2,900 rpm vs. 328 lb-ft at 3,500 rpm) and has no trouble at all effortlessly accelerating the 4,400-pound car. Power comes on in a smooth, even surge. While this drama-free delivery seems a bit boring in the Audi S4 compact high-performance sedan, it's a perfect match for the A8. The BMW's engine is less powerful on paper, but performs about equally well in practice. Both cars can get to 60 mph in about six seconds. Partly because of more thorough insulation, there's less sensation of acceleration in the BMW. You feel a strong shove in the Audi. In the BMW, you glance at the speedometer and find that you've already reached your target speed, and then some. Back to the A8, an eight-speed ZF automatic closely related to those in both the BMW and the Jaguar deals up the ideal ratio for any situation. You can manually shift it, but there's little need to. As in the BMW, the shifter is a monostatic, electronic type (think computer joystick), but in the Audi the conventional P-R-N-D shift order is retained, so reverse can be harder to select. Lots of buttons, but intelligently arranged. Fuel economy might seem an odd, "why to buy" for such a large, powerful car. But this large powerful car manages EPA ratings of 18 mpg city, 28 mpg highway, each one mpg better than the superceded V8. In suburban driving the trip computer typically reported averages in the low 20s, but as high as 25.5. We're a long way from large luxury sedans that had trouble cracking 18. The BMW is rated a bit higher, 19/28, but this is close enough to call it a draw. If you want even better fuel economy, Audi how also offers a 240-horsepower diesel with EPA ratings of 24/36. But the TDI is only available with the long wheelbase and will also cost you another $3,700. BMW offers no comparable car on this side of the Atlantic. For at least the past decade Audi has been regarded as the leader in automotive interior design. The A8's interior appears both expensive and tasteful, with clean lines, plentiful wood and suede, and an upholstered instrument panel. The infotainment display retracts when not needed, enabling a lower, less visually imposing instrument panel than you'll find in competitors. A short, slanted center stack both presents its knobs and buttons at an ideal angle (the Q5 would benefit greatly from the same) and adds sportiness to the mix. This design not only looks sporty, luxurious, and eminently tasteful but enhances the perceived roominess of the front seat. Though a BMW 7-Series is as roomy according to the tape measure, it doesn't feel as roomy. A Jaguar XJ's front seat feels much tighter owing to a much taller center console. Find the tested car's dark gray interior overly dour? Other colors and even color combinations are available. Personally, I found the 2004-2010 Audi A8 a more attractive car than the current one, which was introduced as a 2011. The current A8 has a more massive front overhang and seemingly too little metal between its "bikini cut" wheel openings and the tops of its fenders. Compared to any rear-wheel-drive competitor either A8 has front-wheel-drive proportions, which put the front wheel much closer to the front door. On top of these aesthetic sins, the A8 is too easily confused at first glance with the smaller A6 and even the much smaller A4. If any of these things make the A8's exterior a "why not to buy" for you, you'll get no argument from me. If we can disregard the resemblance to lesser Audis, though, the A8 has a look all its own that appears trimmer and sleeker than the sedans it competes with. In a game of "which one of these is not like the others" involving large luxury sedans, the A8 is clearly the one, with the BMW, Mercedes, and Lexus, even Hyundai's flagship, all much more closely resembling one another. A massive, rounded, chrome-festooned prow that recalls the streamlined vehicles of the 1930s plus the A8's sheer size lend it gravitas to spare. Why Not the 2013 Audi A8 / S8? Though not to the same extent as in the Jaguar XJ, I was surprised that the Audi A8 wasn't smoother and quieter at low speeds. Though this is a fairly quiet car, there's more road noise than many potential buyers expect in a large luxury sedan. Even minor road imperfections effect perceptible quivers within the body structure. The suspension has a comfort mode, but while this mode reduces impacts it also reduces body control and makes the car feel squirmy at low speeds and floaty at higher ones. The BMW feels more rigid, rides more smoothly, and more thoroughly insulates passengers from both road noise and bumps. The A8's seats can be adjusted just about every way its possible to adjust a seat. While they do provide proper support, they're firm and don't mold themselves to the human form, at least not mine. They are very good seats, but those in the Jaguar are better and those in the BMW are best of all, both more supportive and more luxurious. It came from the sea... All-LED headlights are a $1,600 option. So much rear legroom that I felt silly when I was alone in the car. The owner should be back here. In recent years Audi has served as the industry benchmark for interior materials, and most inside the A8 are very good. So I was suprised that some of the switches, most notably those surrounding the infotainment system (MMI) control knob, felt clicky and cheap. The Audi A8's 13.2 cubic foot trunk falls about four cubes short of those in the BMW and Lexus, and even a couple cubes short of the one in the Jaguar. Blame the full-size spare (though the Lexus also has one). The BMW has no spare. Recent Audis have been leading the way in infotainment features. The A8's nav incoporates imagery from Google maps, for a real-life depiction of the surrounding area. Delightful eye candy. Pay a monthly fee, and you can both surf the Internet when the car is stopped or use it as a Wi-Fi hotspot even when it's moving. Audi's MMI infotainment interface employs a large knob in conjunction with surrounding buttons rather than a touchscreen. Though certainly not easy to use, it's easier to use than the average system in a luxury car. Even the base audio system is from Bose, with 630 watts (yes, these ratings should always be taken with a grain of salt) and 14 speakers. Such a system would have been an expensive option a few years ago, and still is in the BMW. But if the Bose system isn't sufficient, another $6,300 will fetch a 1,400-watt, 19-speaker Bang & Olufsen system that's the clearest I've ever experienced in a car (judging from an A7 I drove last year). As it should be for $6,300. As with the front seats, the Audi's rear seat is firmer and less form-fitting than the BMW's. With a starting price near $80,000 and an as-tested price over $85,000, the A8 L 3.0T isn't cheap. But it is a little cheaper than the Jaguar XJ, and over $7,000 less than a comparably-equipped BMW 740Li. If only other European cars were considered as competitors, then price could actually be a "why to buy." But if we also consider the Lexus LS and even the Hyundai Equus, then it's not. It turns out that Audi's supercharged 3.0-liter V6, both seamlessly trusty and efficient, is a very good match for the A8. So what's not to love? The big Audi doesn't insulate occupants as well as the BMW, much less a large Lexus, and doesn't feel as luxurious as a result. For me, there's also a technical coldness to the car. It does many things very well, but with the cold proficiency of a technician. There's less soul here than in the more cosseting BMW, and far less than in the Jaguar. But if you're attracted by the styling (inside or out), or love how tight the steering feels in dynamic mode, or feel most in control with the ever-balanced, never ruffled, point-and-shoot operation of Audi's quattro all-wheel-drive system, then the A8 could be your favorite large luxury sedan. Even with "only" six cylinders, plenty of thrust for a 4,400-pound car. A mere 13 cubes (compact sedan territory), the A8's trunk is the tightest in the segment. Audi provided an insured car for a week with a tank of gas. Mike Montemurri of Erhard BMW in Bloomfield Hills, MI, provided a 740Li for a comparison drive. 2013 Audi A8 / S8 pros and cons, according to Michael Karesh: the best reasons for buying (or not buying) the 2013 Audi A8 / S8. Join TrueDelta to post your own impressions.